Hawkfish is known for its exciting bright coloration which attracts the attention of marine hobbyist to keep them as pets. Unlike common freshwater and saltwater species, different type of hawkfish can exhibit wide range of color spectrum depending on where the location that they are found. The flame hawkfish for example, is cherry red in coloration and that extends even to the fins and eyes. Therefore, if you create a marine tank using white corals as the substrate as in the picture seen below, this will definitely bring out and highlight the coloration of the fish. Despite its special attribute, overall the species is a unique type of fish which doesn’t swim or wander around and they basically stays at the bottom of the tank lying ideal. I remember reading an article related to the fish in a book saying that unsuspecting aquarist who first gets to know the species, actually thought they were sick or dead but in actual fact this observation is just their normal behavior. Further investigation and research about the fish, tells that the reason why they lie idle is because the hawkfish actually lacks an internal organ called the swim bladder which allows them to control their accent and descent in the water. In the natural wild, the hawkfish actually spends most of their time lying close at the base bottom, hiding among corals waiting for foods to come by. They especially love small sized fish and shrimps which make ideal meal for this predatory fish. Despite their knack for meaty diet, the fish however is not as aggressive as what you think and they make perfect companions for your other community marine fish like chevron tangs, banggai cardinal and scribbled angelfish. Usually they will get along well minding their own business but however, caution has to be taken if you intend to mix some highly aggressive territorial species like the yellow dwarf angelfish or other larger sized tang fish together with them. Since they have wide mouth with a large appetite for invertebrates like crabs and shrimps, you should consider excluding them along if you intend to set up an invertebrate tank. So far, there hasn’t been any report underlining successful reproduction of hawkfish species bred in captivity. 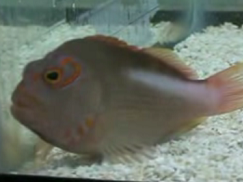 Most of the fish variety such as longnose, archeye and falco hawkfish which you can see sold in aquarium stores are mostly wild caught fish in deep oceans and they rarely survive artificially-constructed home aquarium environment due to acclimatization and the process of getting adapted to confined space living condition. Although they are generally hardy with high tolerance of treatment chemicals and parasitic resistance, you should never neglect their needs and you must aim towards maintaining the best water quality such as having a protein skimmer, powerhead filter system and also using live rocks as natural biological filters.